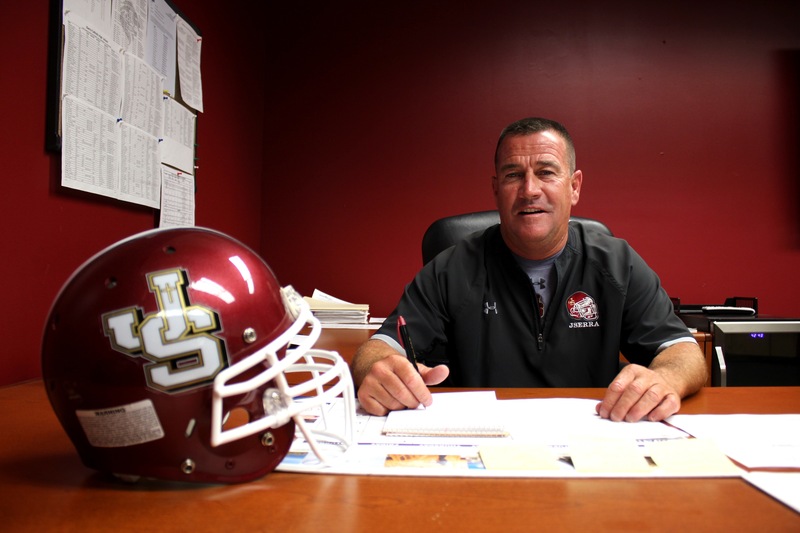 JSerra Catholic head football coach Jim Hartigan is a man of perpetual motion. On a warm, muggy Wednesday morning, he arrives at the school’s athletic campus at 6 a.m. to unlock doors, review schedules and go over the day’s itinerary with his coaching staff. That’s about as easy as the day gets for him. In no time, his varsity team begins to trickle into the weight room, some still rubbing the sleep out of their eyes. Meanwhile, Hartigan stands at the ready, his eyes trained to spot any player in need of some extra motivation. As soon as the morning weight training sessions concludes around 9:45 a.m., Hartigan hustles out to a practice field to watch the future crop of Lions football players, the junior varsity and freshmen squads, go through 7-on-7 and 11-on-11 passing drills. At this time last year, Hartigan’s day would have ended with a post-practice meeting with his staff and an afternoon session with the varsity. But in March, athletic director Dave Lawn retired to pursue full-time coaching opportunities and JSerra placed the interim tag on Hartigan. On June 20, rather than hire an outsider, the school announced Hartigan as its full-time athletic director, in addition to continuing his duties as head football coach. To read the complete article click Lion Nation.